Idealised depiction of a Druid. The further back you go, the more you find how pure our religious sensibilities were. Far from starting out with a plurality of gods, the earliest beliefs we can identify in Egypt and in India, all indicate a belief in one God, with many names and attributes. Over time this became corrupted, with the various powers and attributes becoming worshipped in their own right, along with angels, demons and great men who were also deified, such as Odin and Thor. The evidence for the belief in one God is not just limited to the old empires of the east however, but can also be seen in what we know of the earliest spiritual belief system in Europe, that of the Druids. The Druids believed in one God who was present in everything, that could not be contained within walls or idols. This God had three main aspects to him, that of the past, the present and the future, corresponding with being the creator, the sustainer and the destroyer. This is the same as the original Aryan Vedic belief, which then became corrupted into what we know as Hinduism today, with its many gods and goddesses. It is likely that this triple aspect to God in the Druids understanding, had an influence on the later orthodox formulation of the Christian trinity of father, son and holy spirit, along with other Druidic traditions, such as the sanctified space being a sanctuary for those being pursued. The Druids named these three aspects of God as Bel, Teranis and Yesu. Procopius of Caesaria wrote in 530AD ‘Jesus, Taran, Bel – One only God – All Druids acknowledge one Lord God alone’, showing that although they appeared to have more than one God, that was really just an uneducated view of it. Yesu was the present, the sustainer and the son, and his was also the name of the Druids expected Messiah and healer, the curer of all ills known as the branch, and symbolised by the mistletoe. When the British people unanimously voted to become Christian in 179AD, they never had to actually change the name of their God, for they had been worshipping the same one all along. We can see that this change had to have been by unanimous vote, as this was the requirement for changing the religion of the nation according to the Molmutine laws. Molmus was an early King from around the 4th century BC who set down the first laws of Britain that lasted right up until King Alfred later translated them into Latin in the 9th century. These included many that can be seen to have derived from Mosaic law, such as blood for blood, a portion of land as a birth right and genealogy having to be proved to the 10th generation, in order for someone to be true born. 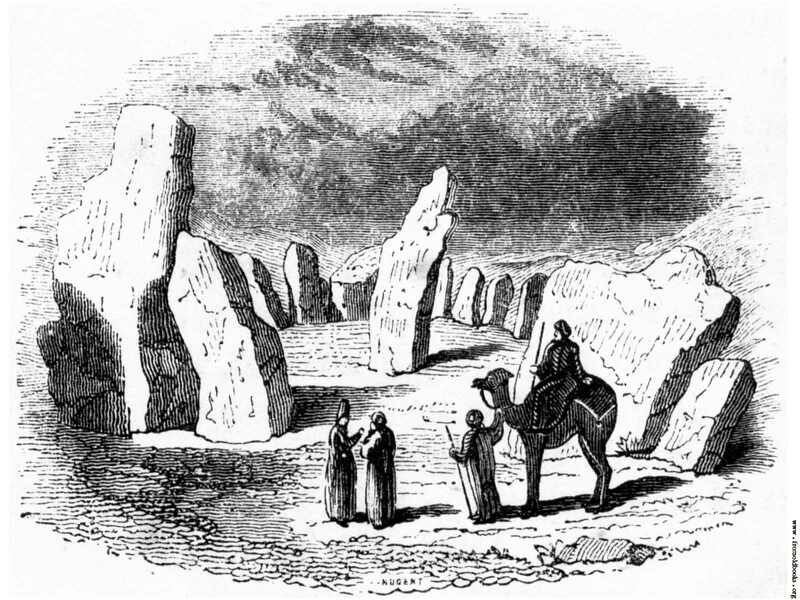 Stone circle at Darab, Persia, just like the one at Avebury (Abiri) England. This cannot have been a later political device intended to justify Christianity, as when you look into what we know about the Druids we can see that they were indeed following a proto-Christian faith in line with that of the old Patriarchs and Levites. The main evidence for this that we can still see today are the stone circles and cairns that are all over Britain, along with the artificial ‘mounds of the congregation’ (Isiaiah ch 14 v 13) which were the original places of assembly where matters of importance were discussed. Christ’s sermon on the mount may have taken place at one of these mounds in Judea. The most famous of these places of assembly in Britain, Silbury hill, is right next to the biggest stone circle Avebury. The artificial hill itself is a technological feat that has been likened to the pyramids and the name of the stone circle Avebury, is derived from Abiri, which is the same word as Habiri or Habiru, the name used in the Armarna letters to refer to the Hebrews and derived from the great patriarch Eber. The first recorded mention of a stone circle anywhere is not in Britain, but in the book of Joshua, ch 4 v 19-21. The 12 stones that Joshua pitches are described as being at Gilgal, which is the Hebrew word for a circle. Interestingly our word circle today is still similar to that original Hebrew word. Most of the stone circles in Britain can be read like calendars, by looking to see where the sun rises. They were used to tell the time of year for sowing and harvesting, as well as for sacrificial offerings. Caesar claimed that the Druids offered human sacrifices at these circles, but to date the only remains found have been of cows, sheep, deer and goats, exactly as was asked for by Yahweh in the Old Testament. Cairns were also used for sacrifices and they were built strictly to the Davidic directive of not using any metal tools to shape them. Some of the flint hammers used to shape the stones at stonehenge were found underneath one of the uprights at the turn of the last century when it fell over. No idols or images have ever been found in Britain either, all in accordance with the Old Testament law. The sacrifices made at these stone altars had to be without blemish and just like in the Levitical rites, the Druid would lay his own personal sins and those of the community onto the head of the victim, before sending the blood to the earth and the flesh to the fire. 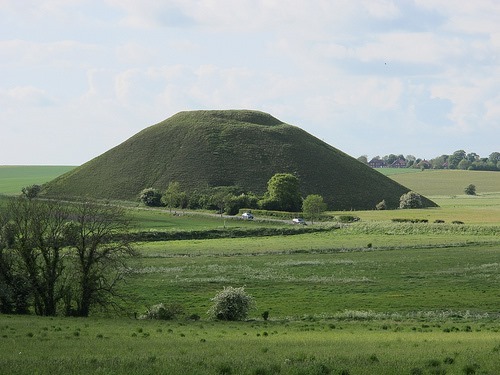 Silbury hill – The mound of the congregation. Stonehenge itself was built using the same unit of measurement as the great pyramid in Egypt and can be seen from its stellar alignment to have been created around 1680 BC. Enoch is credited in various traditions as being the first to record the movements of the planets and by looking at the descriptions of the hours in the day in the book of Enoch, it can be seen that whoever wrote that Apocryphal book had to have been in the north of Europe at the time to be recording it, probably at one of the stone circles in Britain. According to the Welsh triads for every hour of the day at each of the 3 great circles in Britain there were 100 choristers continually singing the praises of God. Hecateus of Miletus writing in 600BC claimed that there were also harpers there, providing a link with David and his famous harp playing. The harp is still the sovereign seal of Ireland to this day and was used as a teaching tool by the druids there to explain the sciences. The druids are recorded as having known the circumference of the earth and the movements of the stars and the nobility throughout northern Europe were educated by them. Each court would also have its druids and bards and along with the aristocratic pupils, there would also be local children listening to the instruction. It was only the religious truths that they kept committed to memory, everything else was written down, probably in Phoenician Hebrew before later in Greek and Latin. The druids themselves studied at the universities in Britain, which were known throughout Europe as containing the purist doctrines, with gentility from throughout Gaul travelling there to receive the best instruction. There were 40 of these original chief seats of the Druids, where there could be anything up to 60,000 students studying at any one time. 31 of these places of higher learning can still be identified as they kept their original name, despite later Roman attempts to change them. It took 20 years to fully learn all that was required to become a druid and you had to have been a part of their caste in the first place, just like the Levites of Israel and the Brahmans of Aryan India. A bard playing his harp, which was also a teaching aid for instruction in the sciences. There were 3 separate orders in all, the bards, ovates and druids. The bards were concerned with the arts, the ovates were the prophets and the druids were the priests and law givers. None of them could be taxed and the people were expected to pay for their upkeep, again, this is exactly the same with the Levites and the Brahmins. During war, it was unlawful to attack them and they were allowed to travel unmolested between the sides, attending to the wounded. They even knew how to break and reset bone, to ensure that it grew back correctly. We can see from this that our ancestors in Europe were highly honourable people, who could be trusted to keep their word. When the Romans came and made no distinction between the castes of people and attacked the Druids, the people were horrified at their barbarity in doing so. The Druids wore white robes, with a jewelled breastplate, exactly the same as that worn by the Levite priests. 5 of these breastplates have been found, where we have been lucky enough to find bodies buried in their full regalia. They had a Cymric or Celtic cross on the back of their robes and when they were not wearing their official clothing, they wore trousers. 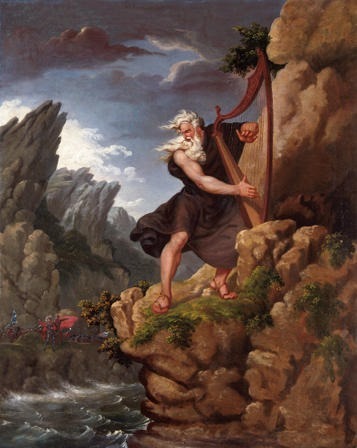 Abaris, a Druid who travelled to Athens, was said to have got there on an arrow of Apollo, which was probably referring to his magnetic compass. He is recorded as speaking perfect Greek and being a worshipper of the supreme being. Magi was the latin word for a druid and was used by the Celtic writers of Ireland to describe them and it has been suggested that the 3 wise men of the Bible may even have been Druids. 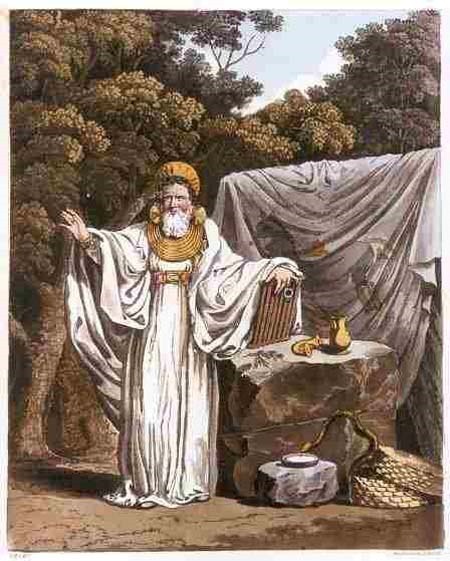 Pliny wrote of the Druids of Brittany as being ‘Gaulish Magi’ and Diogenes Laertes compared them to the Chaldeans of Assyria, the Magi of Persia and the Parsees of India in points of learning and philosophy. Ponce Pilate was said to have been educated by the Druids and the question that he asked Christ ‘What is truth’ was one of the questions regularly debated by them in their colleges. 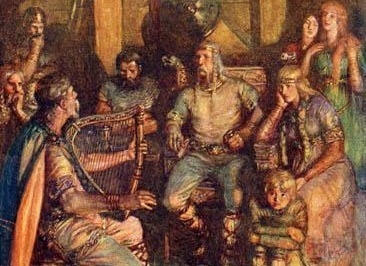 The bards were able to record the druidic wisdom in writing once they became Christian. The Welsh triads mentioned earlier were first written down by the bards of King Arthur’s court in the sixth century. Once the druids became Christian the restriction on writing their wisdom down was lifted and it is from these triads that we can get a good idea of what their philosophy and spiritual beliefs were, as well as what their laws were. That last one I think explains well how what can at first glance seem to be a plurality of gods, is actually just different manifestations of the same God. When Caesar saw similarities between the attributes of God that the Druids honoured and the different gods that Rome worshipped, he was mistaking their beliefs for the same corrupted beliefs the Romans had. The Druids beliefs were obviously incompatible with Rome, for Rome outlawed them the same as they did Christianity. If they had indeed been the same as Apollo and Jupiter, then there would have been no need for them to do that. The motto of the druids was ‘Truth against the world’, which is exactly what Christ preached in more ways than one, since he identified himself as Truth personified and taught rejection of the world. Far from being like the Pagan nature worshippers of the east, our earliest northern ancestors were monotheistic and highly advanced. 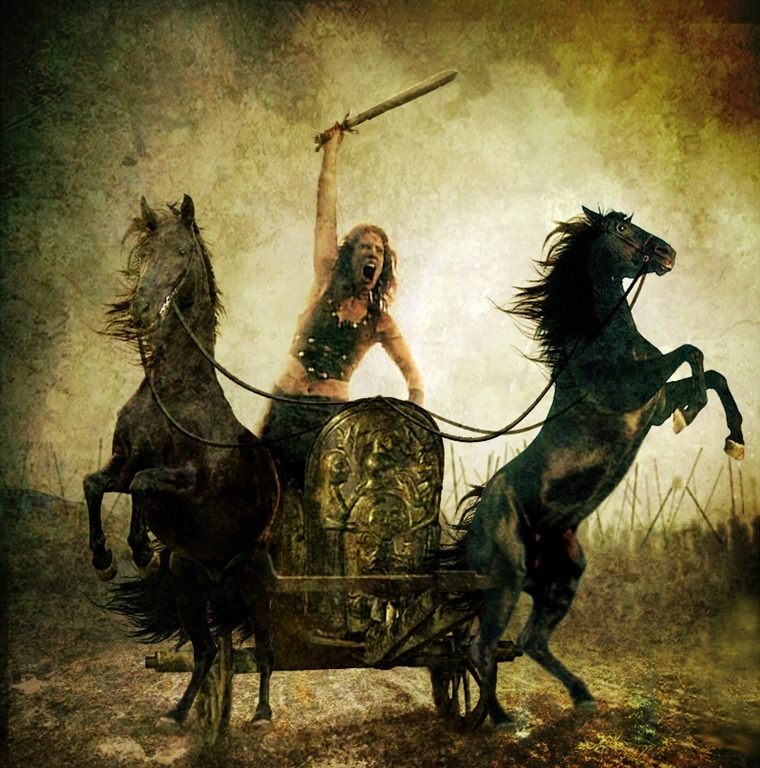 People today are taught that the straight roads in Britain were built by the Romans, but they were not, they were built by the early Britons, who fought against Caesar on them in chariots. These chariots had the same form as the ones used by the Assyrians empire, only they were improved upon by having blades added, as can be seen from the ones that have been recovered. Far from being backward, the ancient Britons had telescopes in the form of wells and could read the stars. Unlike the other religions that the Romans sought to absorb among their own, Druidry like Christianity, was outlawed by them and slandered in their writings, leading to many of the misconceptions we see about them today. People think that by claiming to follow the later Norse gods, they are honouring their ancestors, but their earliest European ancestors were the people in Gaul and in Britain, who remembered that there was only one God. The people who built the stone circles were not praying to Odin their ancestor, but to Yesu the holy branch sprung from the tree of Jesse that was to come. It is likely that the great secret that the Druids held was that they were the original people of the covenant. Their feats of memory had to have been phenomenal to remember all that they did and it had to have been passed down to them unchanged from the earliest times. Due to their strict genealogical code, they were following a type of eugenics that would have ensured that only those who were biologically equipped to be able to use their knowledge, would find out about it. Stonehenge is an incredible piece of engineering, as are the roads, mounds, mine workings and stone settlements that the ancient builder race in Britain created. The last of that builder race’s philosophy was that of the Druids and it evolved seamlessly into Christianity. There were no martyrs made of the apostles of Christ when they came to Britain in the first century, they were welcomed and given the same privileges as the druids were, with land allotted to them and maintenance from the people. They succeeded in converting King Arviragus in the first half of the first century AD, but it was not until a century later that the whole country became Christian, with the positions that were formerly held by the Druids going to the new Bishops, who were themselves of the bloodline of the Druids. This original church of Christ made up of his covenant people would continue the druidic traditions of universities, hospitals and monasteries, sending out missionaries into Europe and converting the Goths and later helping to convert the Angles and the Saxons, despite having been pushed out of southern England by them. The deification of the Saxon ancestors that the Scandinavians took to did not happen until centuries after the druids converted and even that still shows traces of their original heritage as being among the twelve tribes of Jacob Israel. It was common knowledge that the purist European religious doctrine was held by the druids in Britain and they were the first people to accept Christianity and teach it to others. The Vikings do not appear in history until six centuries later and when they did, they had a corrupted form of the knowledge that the Druids originally held. 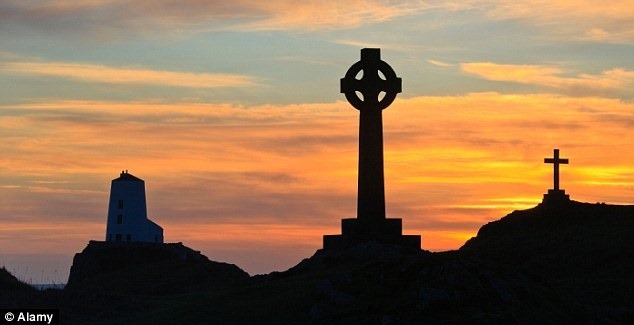 It was this Culdee or Celtic faith of those converted druids that the British King Constantine was instructed in, before he became emperor of Rome and legalised Christianity. This form of the Christian faith was universal for the first 6 or 7 centuries and it is not until the 6th century, that we hear of there being any differences between the church at Rome and the official church elsewhere. The Britons originally refused to acknowledge Augustine’s authority or Rome’s superiority at that time and Augustine actually only managed to convert the Saxon kingdom of Kent to the faith, with the rest of the Angles and Saxons being converted by the Celtic church. It was not just the people who kept the scriptures of the Old Testament, that were waiting for a messiah and following the laws given to them by God. The Druidic priests of Britain and Gaul had memorised their scriptures just as the old Israelites had and their transfer to the new faith, was as much a continuation of the old faith as it was for the Judahites and other Israelite tribes in Judea. The Druids similarities to the Levitical priests point to a shared origin for both. This was common knowledge a few centuries ago with the celebrated antiquarian William Stukely writing extensively about the Hebrew connections with Druidry in 1740 and 1743. Since then archaeology has confirmed those connections, but the Judao-Christian church pays no attention to them, preferring instead for the European people to think that the Jews are the remnant of Israel, and that our ancestors were pagans worshipping a plurality of gods like the Hindus do now.